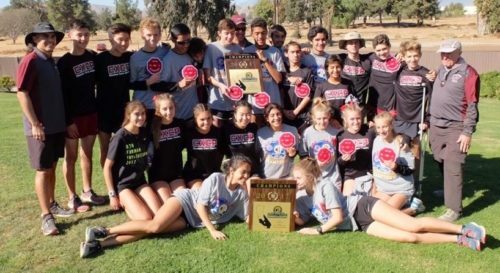 The Claremont girls are three-time defending CIF-SS Div. 2 Champs and two-time defending state champs. They are likely to repeat in both, and this makes them massive favorites to once again be the top team in the San Gabriel Valley. In the mock scoring done for these rankings, the Wolfpack are 122 points clear of the next team! But they are not the only strong team in the SGV. Mayfield, Bishop Amat and La Cañada will all be contending for the Div. IV title, and Walnut may have enough depth behind the Chloe & Emma Arriaga to finish well in Div. 1. Girls can compete at a high level in XC sooner than boys, so these rankings will probably be pretty voluble as frosh and soph girls step up and the season progresses. Honors: CIF-SS Div. 2 Champs; Palomares League Champs; California State Div. II Champions. Notes: The Wolfpack return four of the top five from their CIF Championship team, and they are solidly atop the first CIF-SS rankings. They are easily the class of the SGV, and are probably deep enough to have two teams in our local Top 5. All four returning scorers had solid track seasons, look for a big contribution from junior Isatu N’Diaye who had track bests of 2:19.21 & 5:13.74. Notes: The Cubs return the area’s top rising soph in Suarez, who led the team in 2017 and then showed All-Time SGV talent during track season. But they may be missing last year’s #2, Smith, who did not run track and is not listed on the 2018 XC roster. Look for junior Cameron Gomez (5:29.29 1600) to step up. They’re ranked #3 in the CIF-SS Preseason Poll, so expect big things from the Cubs. Notes: The Lancers return 5 of 7 girls from a team that just missed the CIF podium so they are looking toward another solid year. Not a deep team, it will be important for the Lancers to find solid 5-7 runners, and for Rust and Rivera to return to the form they showed earlier in their careers. Notes: The Spartans have been a team on the rise, toped by their third place finish at the State meet. They return four of their first five, but they are still a small team, so it may be a challenge to be solid 1-7. Rising soph Materese ran 5:08.65 and looks ready to take a big jump. One possible concern is that rising soph Kayley Bond did not run track, and is not on the school’s XC roster. They will be hard pressed to maintain their standing without her. Notes: Cal returns only 3 from last year’s top 7, but the Condors remain one of the deeper teams in the SGV, so they will have another strong season. Top returner Reynoso had a good track season, look for rising junior Sandra Ramirez (5:28.96) and senior Isabela Garcia to join the scoring group. Notes: FP ran the table last year, winning CIF and State and while missing graduating their big front runner, 3 of their first 5 and 5 of 7. Codiga had an excellent track season (2:17.87/5:14.31) so she looks ready to take on the front runner role, but the small school team will be challenged to find two or three more solid performers. Nevertheless, this is something every team in Div. 5 faces, so they’re still ranked 2nd in the Pre-Season CIF-SS Poll. Notes: Along with the boys team, the Lancers have been a team on the rise, narrowly missing Div. 1 CIF Finals last year. They return their top 5 from last year, so just a normal year’s improvement should put them in the Finals, and perhaps will enable them to catch Cal Hi at the top of the league. Look for rising sophs Vigil and Interiano to step up after strong track seasons. A wild card will be rising junior Maddie Franco, who sat out last XC season after transferring, but led the Lancers at 1600 & 3200 this past track season. Notes: This will be a major rebuilding year, with only one athlete returning from last year’s top seven. Arcadia has always been strong, but have not been quite as deep (by their standards) in the past few years. They are deep enough to rank 9th in the SGV, but they will need a number of athletes to step up to contend this year at CIF. Wu will be solid, and rising juniors Maryam Ejigu and Piper Kamae are likely to run well, but they will still need several more to contend. Notes: The Tartans seem to be returning the to quality they enjoyed in the earlier part of the decade. They missed CIF in the tough Palomares League last year, and 6 of their first 7 return. But the difference between Glendora and the next five teams is very slight, so they will need improvement across the board to hold their spot in the rankings and advance to CIF this year. #15 – La Mirada Lancers (’17: #15).